Shula’s Steakhouse at the Disney World Dolphin (A coincidence? I think not.) came highly recommended, and even though I’m a Le Cellier and Yachtsman Steakhouse devotee, I knew I had to try this “dark horse” steakhouse on property. Shula’s is a shrine to all things Don Shula and football. This would be fine with me, except that I’m a huge Buffalo Bills fan and just happened to grow up going to games in the midst of the fierce Dolphins/Bills rivalry — the games where even the nosebleed seats in Ralph Wilson Stadium were sold out and the real “entertainment” consisted of betting on how many fan fights in the stands would end with someone being hauled out of the place by force. So you can understand that I was a big reluctant to patronize this restaurant what with my fierce loyalty to Marv Levy. Regardless, in order to pit the three Disney World steakhouses against one another (which I’ll do in an upcoming post), I had to try this out for the sake of research. We had a reservation for the restaurant’s opening time, and although we arrived on time, the restaurant opened about 15 minutes late and we weren’t seated until 20 minutes after our reservation time. I used the time to wander the restaurant and take some photos of the decor, which is all dark wood, white tablecloths, red wine, and humidors. This is clearly a “man cave” type of place, but it can be highly romantic if that’s what you’re looking for. By the way, I need to mention that this place is dark. I mean really dark. We really wished we’d brought some sort of pen light or something, as we had a very difficult time seeing our food, reading the menus, etc. I even snagged a second candle from the (empty) table next to us so that I could see what utensil I was using. If you have a booklight, bring it. 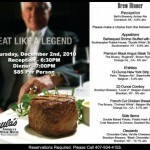 Shula’s Steakhouse is one of five nationally branded restaurant chains run by Don Shula’s company; you can also dine at Shula’s 2 (a sports bar feel), Shula’s Grill and Wine Bar, Shula’s On the Beach, and Shula’s 347 Grill. Shula’s meat comes from Angus cattle they own and raise via the Graham Angus Farm in Albany, Georgia, which has been in operation since the 1930’s. (The “Shula Cut,” according to the website, “is more discriminating and selective than USDA prime or choice.”) If you’re truly adventurous, you can aspire to join their 48 oz. club. Simply gobble up a whole 48 oz. porterhouse and you get your name engraved on a brass plaque and smacked up on the wall. The football menu comes out of nowhere, and feels a bit out of place in the swanky atmosphere Shula’s has cultivated for the restaurant. But it does bring you back to reality when a big ol’ painted football is plopped down on your table. While scoping out the menu, we were surprised to see the server wheeling over a butcher table cart. On it were raw steaks, lettuce, a giant tomato, and a massive potato. Hmm. When he arrived, he began explaining the different cuts of meat and showing us the size of the veggies used in the meals so that we could gauge what we wanted to order. I thought this was a great touch — so few of us are truly educated on meat cuts and flavors. We were also glad to see the size of the potato, which ensured we ordered only one to share between us! We decided to order the cowboy ribeye (my very favorite cut of meat ever) and the filet mignon. We added to the order a caesar salad, an order of asparagus with hollandaise, a hash brown, and a twice-baked potato. (This is NOT a place you go when you’re worried about clogged arteries, my friends.) Here’s what we received. And, yes, everything was served on plates as big as my head. As you can see, this is not only a lot of food for normally-sized plates, this is a way lot of food for the giant plates on which it was served. I’m not kidding you when I say that hash brown was easily 8 inches in diameter and an inch thick. Many, many potatoes died for that thing, my friends. And the dish of asparagus could easily have served a family of four for two nights. What you can’t see is how delicious everything was. The steaks were perfect; the vegetables were fresh and prepared with just the right spices and ingredient additions. This food was no-frills, which is what I, personally, like in a steakhouse. Simple dishes, big portions, well-prepared. We also ordered a fantastic apple crisp for dessert that we, unfortunately, devoured before we remembered to take a photo. For those of you who head to Shula’s, I highly recommend that dessert. It’s a “different” atmosphere from what you’ll find at a Disney steakhouse. Servers are a little less happy than they are after they’ve had Disney training and the dark/romantic feel to the place could take some getting used to if you’re expecting Chef Mickey’s. But cozy surroundings and good service accompany some very tasty food, assuming you’re a steak-lover. More analysis forthcoming when we post the “Steakhouse Throwdown,” pitting Le Cellier, Yachtsman Steakhouse, and Shula’s against one another in the ultimate Steakhouse battle! That hash brown is the size of a tennis racket!!! Good Lordy!!! I am married to a ‘Fin Fan so I may have to add this as a good birthday choice for next year!!!!! Thanks AJ!!!! 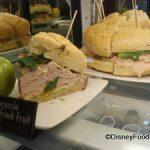 Side question for the Disney foodies out there: are any of the Dolphin and Swan restaurants on the Dining Plan? This is a great, great review, AJ! Loved your description of the Bills games and very much appreciate the warnings about how dark the restaurant is and how large the portion sizes. I’m pretty horrified by how many names are on that 48 oz club plaque. 8 oz is about all I can manage! 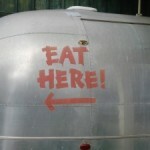 Needless to say, I don’t think I’ll be able to dine here solo–those plates look like they could feed me for four days! Why are so many restaurants so dark you can’t even read the menu??? I’ve run into this more times than I can count. What are they thinking? AuroraBorieAlice — This would be a great choice! I think you guys would like it. Gray — I don’t get it either. I’m going to start bringing a flashlight. Thanks for the kudos! Ok, who could pass up a hash brown larger than their head? That looks yummy. Well, that and all the rest of the food. My husband is a Patriots fan and is irked by the smugness of the ’72 Dolphins during the Pats’ undefeated season (well, until that pesky Super Bowl), so he adamantly refuses to eat at Shula’s. I’m hoping another team can go undefeated this year and actually win the Super Bowl, in which case my husband may relent. LOL. Oh, man, I gotta try this place the next time we do WDW, if only to see how it matches up against my local Eddie Merlot’s (my favorite steakhouse anywhere, ever), the Jeff Ruby establishments (local high end steak emporiums where local sports celebs [Bengals, Reds players] dine frequently, and my second favorite place to get a steak), and Morton’s. And please, please, PLEASE hurry and post that Steakhouse Throwdown piece soon! I’m so anxious to read it! 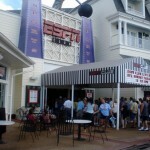 Personally, of the three places I’ve had steak on WDW property (notice that I’m not even counting the “steak” I purchased for lunch at ’50s Prime Time back in ’02 ::shudders::), my rankings are thus: Yachtsman, Jiko, and, coming in a quite distant third, Le Cellier. Ah…Jeff…Jiko is indeed a good steak! I’ll get on that Steakhouse Throwdown soon! I’ve heard the complaint about lighting at Shula’s a LOT! My boyfriend would absolutely love this place, perhaps we should add it to the list! the food looks good.. but… as a fellow Bills fan, i dont know if i could do it…. hey on a recent trip I took a pic at chef mickeys with pluto wearing my Bills hat…. CLWDW — I know. It was hard. A casualty of the job. ;-D Next time I go I should get decked out in my Bills jersey!!! Shayne- I am with your husband. I will not give Don Shula another penny of my hard earned $$. Yes, I love my Patriots! Also the food and service IMO has gone down since our 1st time in 2001. Our last time was about 3 years ago and the steaks were too salty. My hubbys filet was kind of folded over and raw in the fold??!! So – did you ever do the throwdown – and if so, where can I find it? LOVED the review and the Bills references. Wanted to take my husband for a special birthday dinner here. Made reservations well in advance & told them about the birthday. Reconfirmed a couple of days before hand, again mentioning my husband’s birthday. when we arrived and checked in, there was no mention of the birthday. Because the portions were a good size, I shared my meal with my son. The service was not as we hoped for. Very slow and unconcerned. Food arrived and was far from what we expected. I could have gotten better at Outback. We went through our meal, paid the tab, which was over $200, left a decent tip, then asked to speak to the manager. We told him of our experience and his reply was “Well, we’re not a Disney property.” There was no apology for the poor service or quality of the food. I guess since they’re not a “Disney property” that allows them to charge ridiculous prices, sub-par service and a crappy attitude towards the customer.